I chose a pair of lovely cinnamon coloured beads but I was also fortunate enough to do a little bead swap with Kristen so I actually received a whole selection of beads in beautifully coordinating tones and, because they went so beautifully with one of my patinated bronze leaf connectors I decided to use some of these too. 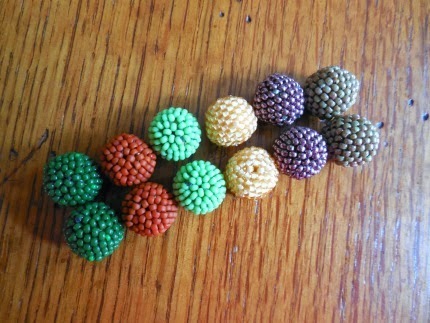 The beads reminded e of hedgerow fruits in various stages of ripeness and I wanted to try and portray that sense of abundance your get when everything is coming to fruition. I decided on a double strand necklace and combined Kristen’s beads with a selection of matching Czech glass, including some gorgeous vintage bronze faceted glass barrels. The back of the necklace is made up of 2 strands of farfalle beads in a dark aubergine and olive green and a handmade bronze wire clasp. the final touch is a tiny flower bead hung from the bottom of the leaf connector. I apologise for the photos not being the best in the world…for some reason I had great difficulty getting ‘unfuzzy’ photos and I can only put it down to my broken ankle…that’s my excuse and I’m sticking to it. 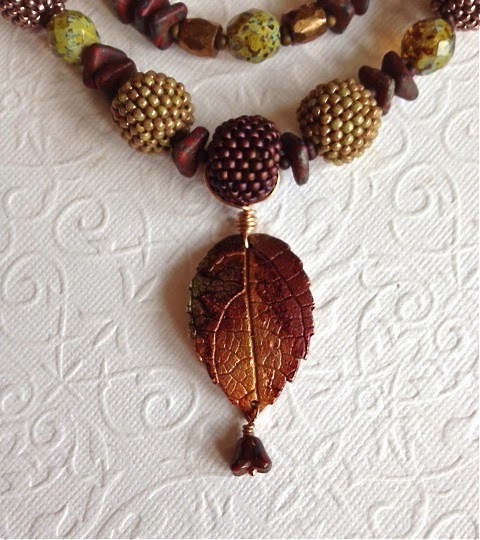 I hope you’ll join us in our little blog hop to see what the rest of the team and our guest artist did with Kristen’s wonderful beads.